When I teach a new class for the first time I’m always concerned about how it will go. Is it too challenging? Too simple? Are the directions clear? Did I underestimate the time needed to complete it? As it turned out, I needn’t have worried. It was an enjoyable evening. I took a selection of beads and several finished examples so each woman got to choose her own colour scheme. They did a wonderful job and completed their beaded ornament covers with time to spare. They also gave me several good ideas for clarifying the written instructions. Their feedback is worth its weight in beads :-). Categories: Events, Ornament Covers | Tags: beading class, beadweaving | Permalink. I like beaded ornaments. They’re pretty and easy to make once you have the basic pattern. You can hang them in a window to catch the light or add a special touch to your Christmas tree. 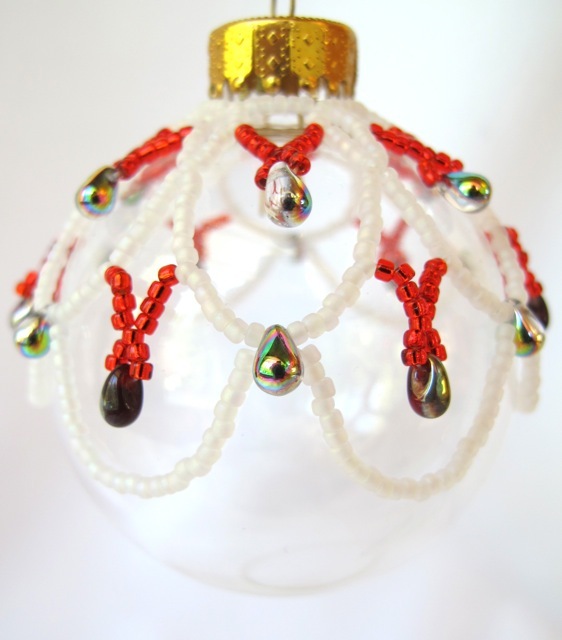 This fall I’ll be offering a class on making beaded ornaments like this one. If you’re interested you can find more information here. Categories: Ornament Covers | Tags: beading class, beadweaving | Permalink.